Everyday Spoken Burmese is for those seriously learning to understand and speak Burmese in a short time. It covers the most fundamental building blocks of the colloquial Myanmar Language. Burmese language has parts of speech known as particles and post-positional markers which play critical roles in sentence structures. Heavy emphasis is placed on those words. Color-coding is used to make grammar study easier. Explanation is concise. Words are carefully selected for completeness. One cannot fully understand Burmese until those words are understood. 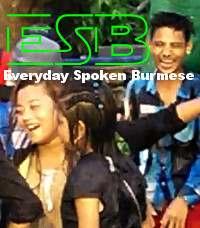 Download Everyday Spoken Burmese in PDF format. MAIN MENU. Click (or touch) table headers to sort by English, Burmese, or Romanization. This ending postpositional marker indicates that something is positive and agreeable, or simply states something "is" what it is in the present state described by the adjective. It describes what you experience with the five senses and what you feel and think. ပူတယ် pu2 deare2 It's hot. လှတယ် hla1 deare2 You're pretty. This ending particle word is a simple question mark. ပူလား pu2 la3 Is it hot? The activity indicated by the verb is going to happen in the near future. There is intention to do something. သွားမယ် thwa3 meare2 I'm about to go. Good bye! ယူမယ် yu2 meare2 I will take it. I intend to take it. Asking for intention described by the verb. Try to understand မ | ma1 before the question mark လား | la3 as a short spoken sound of မယ် | meare2 in the question. ယူမလား yu2 ma1 la3 Do you want it? Do you intend to take it? The event indicated by the verb is going to happen in the near future, but one has no control over it. There is expectation or anticipation, not intention like မယ် | meare2. ဧည့်သည်လာလိမ့်မယ် eare1-theare2 la2 lain1 meare2 Visitors will be here anytime soon. မိုးရွာလိမ့်မယ် mo3-ywa2 lain1 meare2 It's going to rain. တော့ | dau1 is a verb-suffix particle to indicate that the action is imminent or about to happen in the near future. စားတော့မယ် sa3 dau1 meare2 I am about to eat. စားတော့မလား sa3 dau1 ma1 la3 Are you going to eat now? စားတော့မယ် sa3 dau1 meare2 Yes. သွားတော့မယ် thwa3 dau1 meare2 I am about to go. သွားတော့မလား thwa3 dau1 ma1 la3 Are you about to go? သွားတော့မယ် thwa3 dau1 meare2 Yes. တော့ | dau1 without မယ် | meare2 is a persuasion or an advice to do something immediately. သွားတော့ thwa3 dau1 Go now. It's time. အိပ်တော့ ate dau1 Sleep now. It's time. တော့ | dau1 can also be used as an emphasis between two repeating verbs or adjectives. But, there is unmentioned negative side to it. တော်တော့တော်ပါတယ် tau2 dau1 tau2 ba2 deare2 She is bright alright. This is how you say "no" in Burmese. မလိုဘူး ma1 lo2 bu3 No need. I don't need it. မကြိုက်ဘူး ma1 kjite bu3 I don't like it. ကြိုက်လား kjite la3 Do you like it? မကြိုက်ဘူး ma1 kjite bu3 No. ဝယ်မယ် weare2 meare2 I will buy it. မပူဘူး ma1 pu2 bu3 No. Immediate plan has changed if immediate action before တော့ | dau1 is combined with negative pair မ -- ဘူး | ma1 xxxx bu3. မစားတော့ဘူး ma1 sa3 dau1 bu3 I am not eating anymore. မသွားတော့ဘူး ma1 thwa3 dau1 bu3 I am not going anymore. မလိုတော့ဘူး ma1 lo2 dau1 bu3 I don't need it anymore. The person asking the question expects somewhat a negative answer. စားဦးမလား sa3 ome3 ma1 la3 Do you still want to eat it? This polite word softens the tone. စားပါ sa3 ba2 Please eat! စားပါဦး sa3 ba2 ome3 Won't you please eat? စားပါဦး အဘ sa3 ba2 ome3 a-ba1 Won't you please eat, Grandpa? Someone is telling you not to do something. Polite ပါ | ba2 softens the tone from ordering tone to a suggestion to prevent something unpleasant. မစားနဲ့ ma1 sa3 neare1 Don't eat that. မစားပါနဲ့ ma1 sa3 ba2 neare1 Please don't eat that. မစားပါနဲ့ ဦးလေး ma1 sa3 ba2 neare1 u3-lay3 Please don't eat that, Uncle.